One night at a garden dinner party Houston businessman and wine-lover Terry Davis met veteran winemaker Wayne Donaldson and the two hit it off and became quick friends. A serendipitous meeting, the pair would soon be united by their mutual passion for Napa Valley and their love of wine. After learning of Terry’s desire to make his own Napa Valley wine, Wayne contacted him shortly after their meeting with an opportunity to purchase three tons of Diamond Mountain fruit. For Terry, the moment was surely a ‘Frisson’ – the French description for a moment of intense excitement or thrill. With Wayne’s partnership and 25 years of wine-making expertise, Frisson Wines was born. Appearance: Medium-dark ruby becoming a vivid garnet at the rim. Nose: Nicely aromatic with crushed red flowers, earthy sour cherries, herbs, bell pepper, menthol and a touch of leather. On the palate: The Frisson Wines Cabernet Sauvignon 2011 is even fuller than the slightly more delicate nose and appearance suggested. It has good depth and a firm an structured personality. It’s generous mid-palate offers copious dark red fruit: cherries, currants and plums supported by licorice, bell pepper, graphite, spice and sweet tobacco. It finishes with good length and chalky, drying tannin. This should come together nicely in a few years. Should you buy? 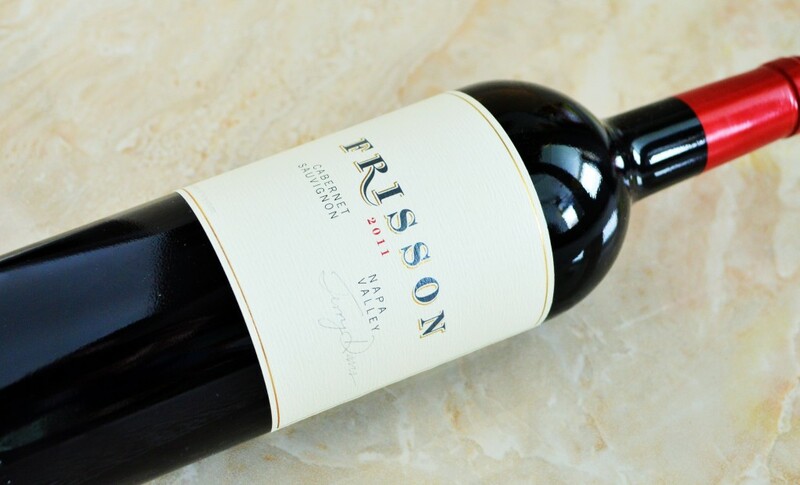 The Frisson Wines Cabernet Sauvignon 2011 is well-crafted, expressive and displays good potential. If showing up to your next dinner party with a small production (only 150 cases produced) boutique Cabernet sounds appealing, then look no further! For Terry and Pam Davis, proprietors of Frisson Wines, the creation of a small production, harmonious and terroir driven Napa Valley Cabernet produced from luxurious grapes at an affordable price was their “Frisson”. With the successful launch of their brand, the folks at Frisson Wines now have the ability to share their fruitful vision with us lucky wine lovers. After sipping a few glasses of this delicious Cabernet, it’s immediately apparent that this project is a labor of love for the Davis’ and winemaker Wayne Donaldson. In a vintage where one must be pretty selective this relatively new winery reminds us that exceptional wines were made in 2011 despite the challenging vintage. With the Frisson Wines Cabernet Sauvignon 2011, they have almost guaranteed that you will experience your own thrill with your first taste! To purchase, visit the Frisson Wines website. This entry was posted in Between $50 and $74.99 | Reviewed, California Wines - Reviewed, Red Wines, Under $100, Under $75 and tagged Best Cabernet Sauvignon Under $100, Frisson Cabernet Review, Frisson Cabernet Sauvignon 2011, Frisson Cabernet Sauvignon Price, Frisson Wines Cabernet Sauvignon, Frisson Wines Winemaker, Terry Davis of Frisson Wines, Top Napa Cabernet under $100, Wayne Donaldson of Frisson Wines on March 15, 2015 by The Fermented Fruit.